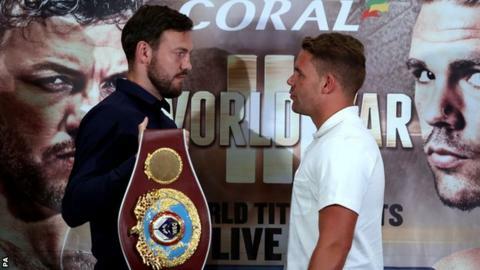 Irish world middleweight champion Andy Lee's WBO title defence against Briton Billy Joe Saunders will be on 19 December at the Manchester Arena. The fight was originally scheduled for 19 September at Ireland's Thomond Park but Lee, 31, withdrew with a virus. It was rearranged for 10 October at the Manchester Arena but Saunders, 26, was injured in sparring. "The delay in the fight has just made me more determined, if that is possible," said Lee. "Once I have beaten him on 19 December I can move on in my career and unify the titles." Saunders, who has held the British, Commonwealth and European titles, has won all 22 of his professional fights. Lee, with 34 wins in 37 contests, won the WBO belt in December with a sixth-round stoppage of Russian Matt Korobov. "Like Lee, I just want to get in the ring and fight," said Saunders. "We've talked and talked for months, now we just want to fight."